This unique two part course offers the experienced healthcare provider the opportunity to "re validate" their (BLS) Basic Life Support skills during the Inital ACLS course programs. You must complete the BLS for Healthcare Providers course completion challenge testing during the Advanced Cardiovascular Life Support (ACLS) and BLS written exam, an additional $42. If you do not have an American Heart Association BLS Healthcare Provider card you must take a full course. Textbook not included in Renewal course. 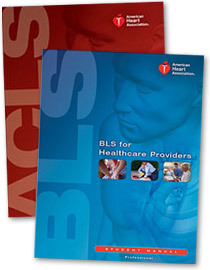 This unique two part course offers the experienced healthcare provider the opportunity to "re validate" their (BLS) Basic Life Support skills during the Renewal ACLS course programs. You must complete the BLS for Healthcare Providers course completion challenge testing during the Advanced Cardiovascular Life Support (ACLS) Renewal and BLS written exam, an additional $42. If you do not have an American Heart Association BLS Healthcare Provider card you must take a full course.